There's not much time to react when disaster strikes, especially when it's a life or death situation. You want to get out safely and as soon as possible with your family, and that includes your pets. Saving your pets comes with its own set of circumstances, however. For instance, many evacuation centers, should you be displaced there, don't allow pets. So what do you do? Here's the best course of action to protect your human and four-legged loved ones, should you need to evacuate your home quickly. At least three days worth of food and water, plus portable bowls. Vet records from the previous two years, including vaccinations, your pet's microchip number, medications, and any allergies. Be sure to have a supply of your pet's meds packed as well. First-aid kit for pets; the Red Cross provides a comprehensive list of what you should have if you want to DIY (if you have a first aid kit already, there are several items that will also work for your pets), but you also can buy one from Amazon. Muzzle if your animal has a tendency to be aggressive, especially when frightened. Treats to calm your pets. Photo of your pet to assist search and rescue should it go missing. Collar with ID and rabies tags. Your vet's phone number, in case of emergency. Extra litter and a spare litter box if you're a cat owner. In the event of a disaster, your dog or cat can break limbs or incur wounds with serious bleeding, and knowing how to respond appropriately in that moment can mean the difference between life and death. A reliable pet GPS tracker also makes it possible to keep track of pets during an emergency. The lightweight, waterproof device attaches comfortably to your pet's collar or harness, and allows you to track your pet's location anywhere in the U.S. The battery on these typically lasts several days, providing an ample window to find your pet in the event you're separated during a disaster. In case of emergency, first-responders will be able to identify your household as one that may need pets rescued with a pet alert sticker placed where it can be clearly seen. "Write down the number of pets inside your house and attach the static cling to a front window," says, "The Pet Lady" Dana Humphrey. "This critical information saves rescuers time when locating your pets. Make sure to update the number of pets listed [when your pet family grows]." Humphrey also suggests leaving your pet's carrier and emergency go bag by the door so you can access it quickly and easily in the event that you have to leave in a split second. 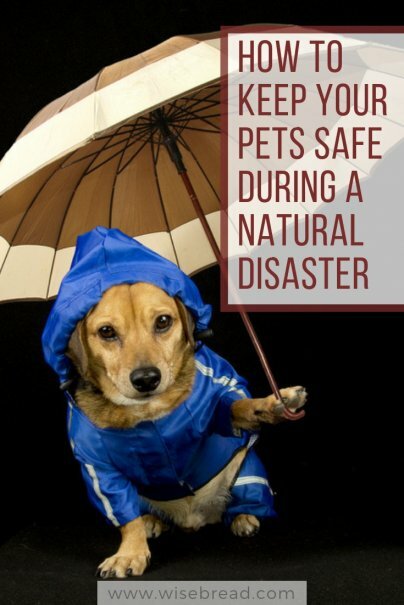 Your pet is a member of your family, and should be treated as such when you're evacuating. Don't leave your animal in vehicles, tethered, or crated without you or a family member. "To help avoid having to make such a difficult choice, identify and create a list of places to evacuate with your pets in preparation, such as pet-friendly hotels or boarding facilities, and include contact information and addresses for each," adds former Bachelor Sean Lowe, who partnered with the Banfield Foundation following Hurricane Harvey to promote pet preparedness during disaster situations. Following a natural disaster, AKC Disaster Relief trailers will have necessary items your pet may need if you weren't fully prepared to evacuate. Even if you were prepared but need to stock up on certain necessities, feel free to do so. Check with your state branch of FEMA to see if there is one near you. If so, include the location of the trailer and contact information in your emergency go bag so you can get help if the time comes.